Turn off the power to your broadband modem. If there isn’t an on/off switch, remove the power supply to the device. Connect the power adapter to the back panel of the wireless router. Check that the power LED illuminates. Connect an Ethernet cable to the broadband modem. Restore the power to the modem. Insert the other end of the Ethernet cable into the WAN (wide area network) port on the back panel of the wireless router. Insert another Ethernet cable between LAN Port 1 (on the back panel of the wireless router) and any available Ethernet port on the NIC (network interface card) of the laptop, which you’re going to use to configure the WiFi system. Restart the laptop connected to the WiFi router. 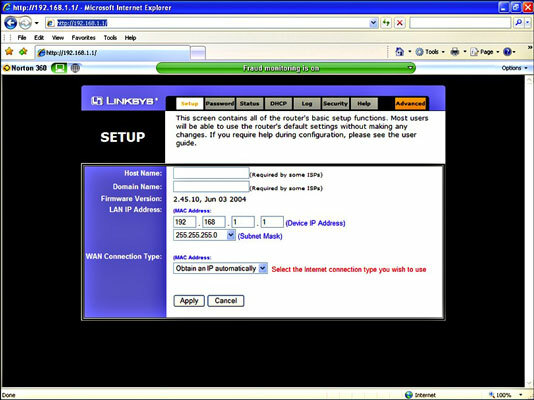 In the address bar of the browser, type the URL for the built-in setup screen of the wireless router. For example, type http://192.168.0.1 for most D-Link routers. A typical automated process (wizard) includes the option to establish a password for control of your router. You should do so. This password is just to control settings made for the router.